I’m so happy with this little girl! 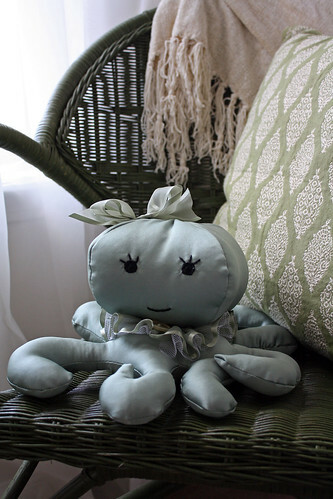 I think she’s the prettiest octopus I have made by far! I was contacted last week by a woman who lives here in Jacksonville. She was interested in having a stuffed animal made for her soon to be born niece. She found my site and liked the octopus. What makes it really special is that it is made from her bridesmaid dress which she wore in her brother’s wedding (the one having the baby girl)! How sweet is that? Even the ribbon I used came from ribbon that was on her bouquet. I also used the ribbon and some of the petticoat to create the ruffly collar (which is removable; I sewed on a loop of elastic to go around the button to hold it on). I ended up embroidering the eyes too because they want it to be infant friendly. So, I found out you can use fancy material to make this octopus. It won’t turn out as round as the fleece ones, but it is doable. Aww, it’s very pretty indeed. And what a lovely gesture! That is the sweetest thing. And it’s also a great use for a dress she may have never worn again. adorable! love the color and the idea of using that fabric! Oh this is right up my alley. I love it! So elegant! What an incredible gift for this new baby! You did an awesome job on this! How darling! And such a sweet sentiment to have used the bridesmaid dress as the fabric. Not quite, but it is close. I never thought of that, but you are so right. Little ones do love that satin feel! ps i didn’t comment on the post of your hubs shirt, but that’s awesome about how you made him something and he got so excited! darling. 🙂 I have made few more for gifts. Thank you again for choosing me as a test sewer. loved it.